Sometimes I worry that eventually you’re all going to get sick of my weekend updates which end up usually like “look how much food I ate!!!!”. In this particular nightmare of mine I show off all the glorious snapshots of my meals and snacks and I come back to check the post and it’s crickets (well, besides my family commenting that I’m taking good care of myself and “looks like you’re having lots of laughs”). 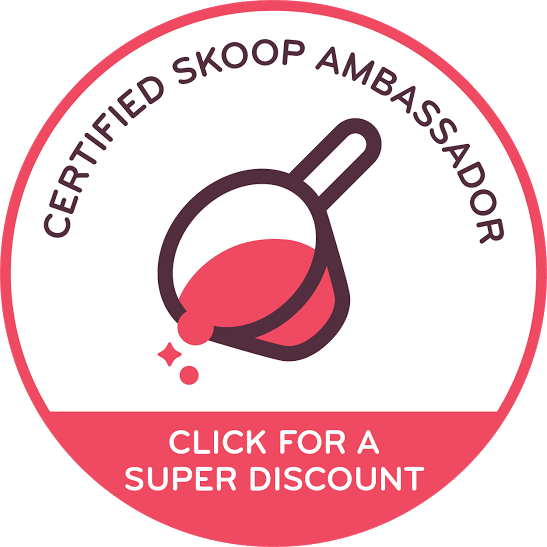 So thank goooooodness I have something to else to share this time around. I had a wonderful weekend full of winter-running, body-sculpting, and museum-exploring. Classy, right? I had my first bout of winter running which luckily I was able to make happen before the snow fell today. 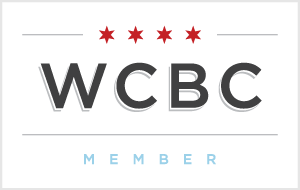 Yes, it’s currently snowing in the Windy City. But while it wasn’t snowing this particular day, it was in the 20s and I started out FREEZING. Thankfully, as usually happens with winter runs, I warmed up after the first mile or so, but those first ten minutes of freezing fingers is no fun at all. Yep, winter is here. Which means my bed and I are about to become even better friends. I was a good little runner and stretched/iced my knees and shins before hopping on a train downtown for a night at the museum. 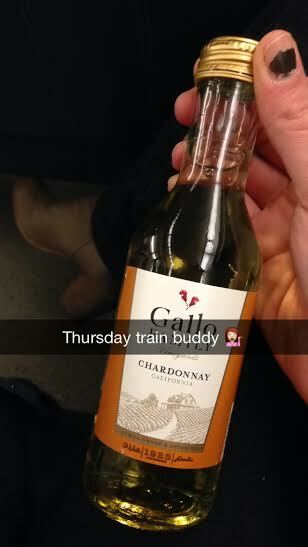 I enjoyed a little pre-museum cocktail on the train because it doesn’t get any classier than mini bottles of wine on the train. 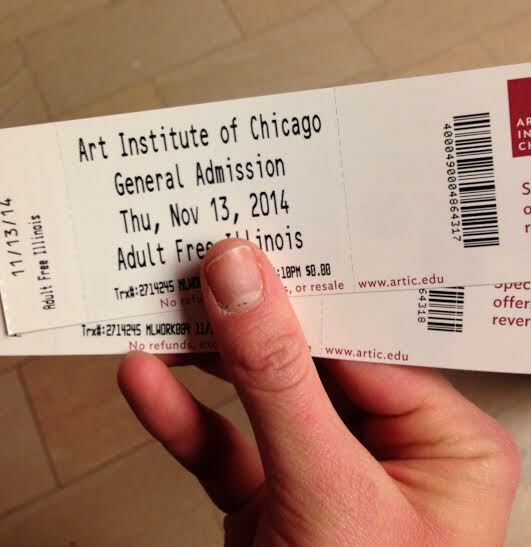 Thursday nights in November are free at the Art Institute of Chicago (recently rated #1 museum in the world!) and there’s a local bar nearby with 1/2 off bottles of wine so my night was basically decided for me. I mean, you don’t stumble upon deals like that very often in the city. The one time in the history of mankind that being an Illinois resident SAVED people money. My beautiful, beautiful city in the background. With a side of smirk. 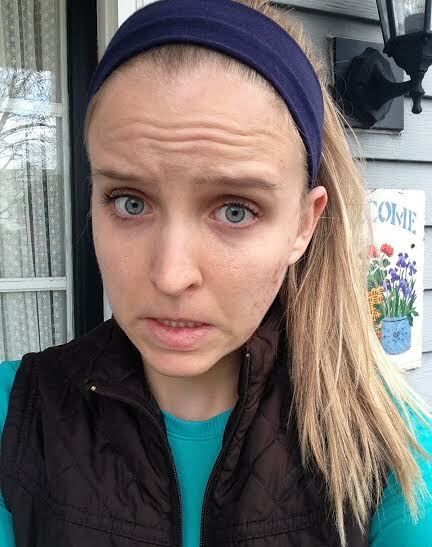 That is the face that still gets carded for R-rated movies so I’m not sure what I was trying to do here. Megan learning about our favorite piece in the museum (that we saw. That place is HUGE and we’ll have to go back). The folks at the Art Institute mean serious business. There were at least five security guards in every room of the place, and if you got too close to the art (ahem, my bad!) a quiet but noticeable alarm went off. I mean, if you’re going to be #1 in the world I suppose you should preserve the art. Understood. 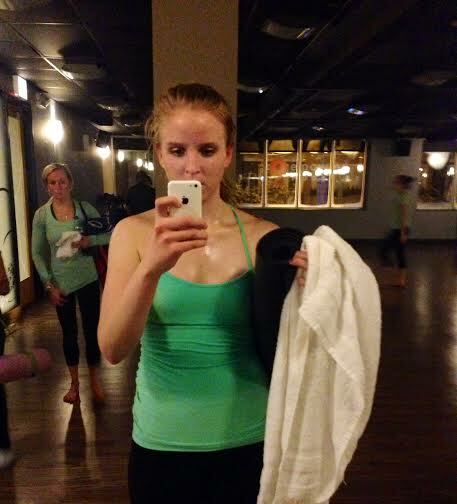 1) Don’t sit next to the heater in hot yoga sculpt. So. much. sweat. I could SEE the heat blowing into the room above me. Oh, don’t forget your water bottle. Oh, and wait until everyone is out of the room before you take a mirror selfie. I wanted to turn around and say IT’S OKAY I HAVE A BLOG DON’T WORRY! I JUST HAD TO DOCUMENT THE SWEAT! 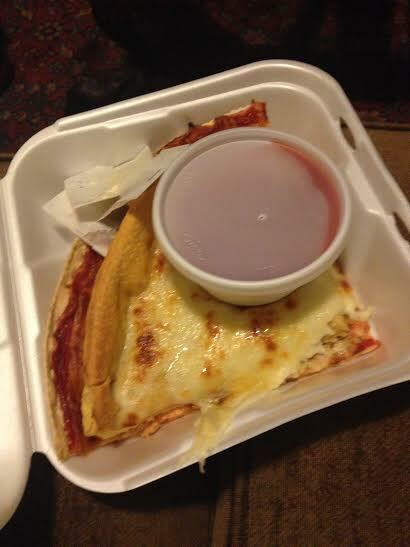 2) Don’t show up at a pizza place ten minutes before it closes because they’ll be almost out of deep dish and instead of two slices of the good stuff you’ll be forced to have one slice of thin crust. Thieves. Thin crust being smothered by its deep dish counterpart. Crushing the competition since 1943. 3) Don’t assume no one can hear what music you’re listening to. Because you’ll end up listening to this song on repeat and then realize everyone around you can hear and is actually getting pretty sick of the song. I have so many new friends on the train! I learned some valuable lessons this weekend, scored a great deal on a classy evening, and even worked out a bit. All the best things in life! Also, lucky you, you got to see my face FOUR times in one post – I’ve definitely hit my quota for the week. What’s a life lesson you recently learned? First of all, I need to get my boyfriend that t-shirt about not getting out of bed. Fo’ sho’. Second of all, the wine was a nice touch! Third of all, I got to tour a local museum this past weekend as well and it was fabulous! Great minds think alike. Have a great week!! That looked like such a fun evening! I would love to go to that museum… One day! Mustaches!! Great in theory, but horrible in reality. So. Much. Scratchiness!! Love how they are spelt so differently in our two countries!! 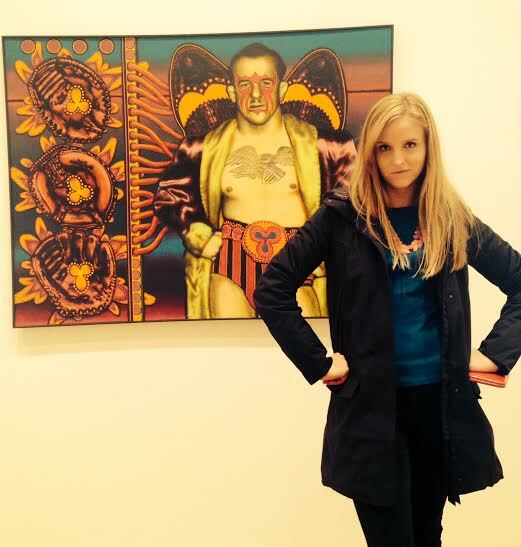 I love your imitations poses in front of the art! Sounds like you had a great weekend.. One thing I learned this weekend is how to stay even warmer on winter runs – wear your pro compression socks on top of your long leggings. Good idea! I’m going try this! I need that t-shirt. It was almost impossible to get out of bed in the cold this weekend. I am still getting used to the cold after being back from Jamaica. Jamaica and then back to thesw temperatures? Torture. Stay in bed a few extra days lady. You and I would be so much trouble in serious places. For realz. LIke we would totally get ourselves kicked out. I am ok with that. And I need that shirt like now. At least you got homemade pizza, which shows that they’re legit with their pizzas! 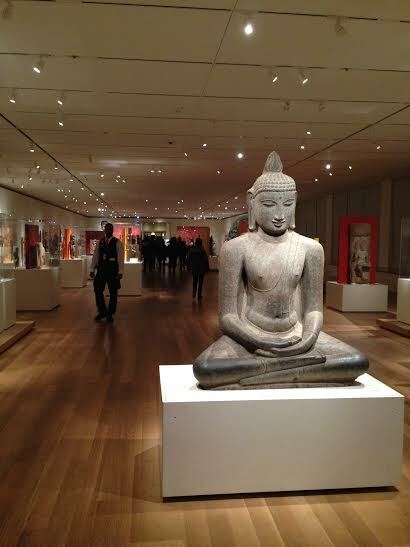 What a beautiful museum too; I like the buddha even though I’m not buddist. Speaking of winter running, I need some new gloves to keep my hands warm.they’re freezing! IT’S OK I HAVE A BLOG THIS PHOTO IS FOR MY BLOG I SWEAR. <<my thoughts every time I photograph food in a restaurant. 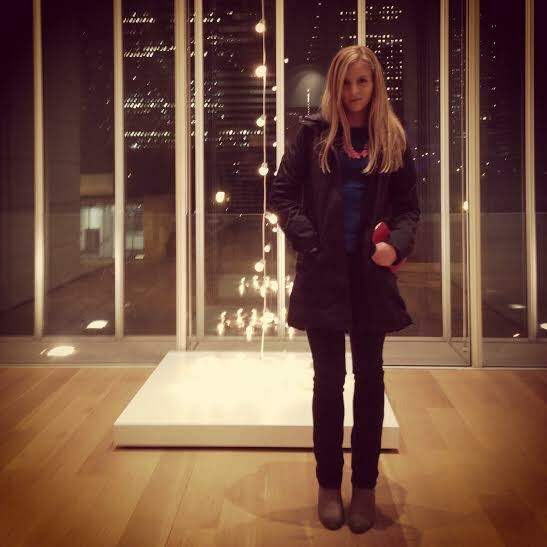 The night at the museum sounds like a fun and affordable night….plus wine…. WIN. Hahaha yeah im starting to get used to the picture aspect of it all but it still feels weird. Like nooo i promise im not instagramming my sweaty self! Haha I feel the same way in my yoga studio. I have yet to bring a phone in, though. My fellow yogis are VERY serious and I’m pretty sure I’d get banished. This post reminds me that I really miss Bikram yoga especially now that it’s COLD!! Love museums too! Fun fun!! OMG, I don’t know how you do heated yoga! It’s cray! I’m forever wiping off sweat and sipping water so I can’t ever get enough out of a heated practice. I LOVE thin crust lol! Much NOM. free museum admission and half off wine sounds like a perfect lil evening! my wknd was wonderful — running and barre and so much good girl time with one of my bffs, including a sleepover (aww we’re so cute) and an entire day and a half on her couch eating good food, drinking pumpkin beer and studying. it was perfect. Haha yeah exactly. I dont post selfies on social media but i have to take them for the blog otherwise how would we all get to know each other? Cmon. It’s a balance of words, food pics, and selfies! I was not aware that the Art Institute is free on Thursday nights! Good information to know! I’ve been there a bazillion times (my parents used to always drag us there when we would come to Chicago when I was little. It was THE WORST. All I wanted was to go to the American Girl store 😦 Hahahaha. ), and I’m still pretty sure I’ve only scraped the surface of all they have. There is SO much to see there! 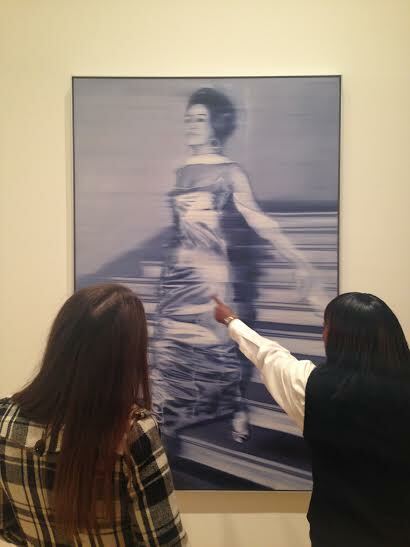 You could spend the whole day at the Art Institute and still not see everything, I bet. What a fun night at the museum! I can’t believe it is already snowing in some ps rts of the country. Way too early for that. Im just happy ours isnt sticking! Some places have multiple feet already it’s crazy!! That shirt is sooo funny! I need it! It was SO cold today! I almost couldn’t survive my trip to Costco. ALLLLLL week I’ve had those thoughts about my bed and warmth. I have been a big fat running WUSS!!! I want to go to this museum, how cool!